I’ve always considered libraries to be magical places. Susan Orlean is a lifelong fan of libraries as well. Her latest book is “The Library Book” (Simon & Schuster, $28), yet another marvelous piece of writing from one of the best nonfiction authors of our time. Using a single foundational event – the massive fire that took place at the Los Angeles Public Library over 30 years ago – Orlean constructs a paean to libraries, leaning into LAPL-related specifics while also spinning off into thoughtful and celebratory musings on the intellectual, cultural, historical and political impact of libraries. April 28, 1986, began much like any other at the Los Angeles Public Library, with patrons waiting outside for the official opening time so that they might be let into the building. However, everything changed that morning. A fire alarm went off – a not-uncommon occurrence in a building as behind-the-times as the Central Library. However, this wasn’t the usual false alarm – this was a catastrophe. It turned out that this particular library was ideally suited for a conflagration unlike anything firefighters had ever seen. The combination of oxygen availability and a nigh-endless fuel supply meant that this fire reached unheard of temperatures – as high as 2000 degrees. Despite the best efforts of half the city’s firefighting force, the flames burned for some seven hours. All told, 400,000 books were destroyed and another 700,000 were damaged. Priceless, irreplaceable items – photographic archives, out-of-print books, huge special collections, rare manuscripts – were gone forever. It remains the largest library fire in United States history. Orlean uses this tragic event as a jumping off point; it is the springboard from which she launches herself into her library deep dive. And what a dive it is. She spends time with current LAPL staff, exploring every department with customary thoroughness and curiosity. From the director on down, Orlean talks to numerous people with powerful, long-standing connections to this particular library, including many who were there for the fire and its direct aftermath. There’s also exploration of the fire’s cause – including the wannabe actor who was the prime suspect – and the public’s reaction to what happened. “The Library Book” also delves into Los Angeles Public Library history. We get a breakdown of the LAPL’s 19th century origins and the opportunity to meet some of its earliest directors, including Mary Foy – who at just 18 years old was named to lead the library in 1880 – and the iconoclastic eccentric Charles Lummis, a character among characters whose great accomplishments with regards to the library were offset by the aggressive strangeness of his personal life. But it’s not all LAPL-specific. We also get the tangential exploration that Orlean is known for; we benefit from her willingness to follow threads as they capture her interest. A moment is taken to explore the impact of Andrew Carnegie’s devotion to library construction. There’s a look back at deliberate library destruction through the ages as a potent weapon of cultural warfare. She even goes out in her backyard to set a book on fire just to see what it’s like. With “The Library Book,” Orlean once again demonstrates her transcendent talent for bringing her subjects to vivid, breathing life. Few can match her combination of voluminous research capabilities and exquisite narrative skill – and none exceed it. The readability of this book borders on the compulsive – it practically cries out to be consumed. Her voice echoes throughout, a whisper-shouted sermon on the evergreen importance of this particular cultural institution. Orlean’s passion burns white-hot, hotter even than the windowpane-transparent flames that tore through the bowels of the Central Library on that fateful day in 1986; there’s a certainty informing her every word. 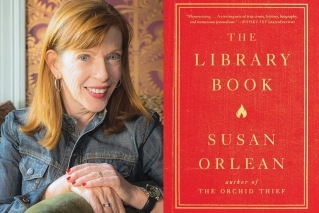 To Susan Orlean, a library is more than a mere building. It is a concept, a great notion that should be celebrated. She notes the necessary evolution of the modern library in the digital age without devaluing the contributions that came before. What libraries are might change, our society’s need for them will never fade. “The Library Book” is ideal reading for any bibliophile. Book lovers tend to be library lovers … and library lovers will recognize the kindred spirit residing on every single page of this book. I recognized my own deep-seated love of libraries in these words, a shared affection for an institution that had a fundamental impact on who I became. Susan Orlean is one of the best there is … and this book is an outstanding illustration of that truth. Check it out for yourself.